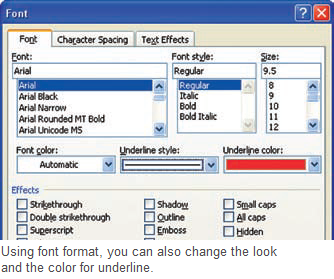 If you want to underline text in Word, the text editing uses the same color for it as the text. But you want to underline the text in a different color. Select the text passages to be underlined and open the menu command “Format | Font” and then select the desired format in the “Underline” combination field. With “Only words”, you can determine that Word only underlines the words from the selection without spaces. All other types, underline the entire selection including the spaces. In that, you can select from various underlining types. As soon as you make a selection different from “(none)”, Word activates the “Color” combination box to the right. Select the color that Word is supposed to use for underlining. Confirm your selection with “OK”. However, the changed formatting only applies to the currently selected text passage. If you subsequently underline other text passages with [Ctrl]+[Shift]+[U] or with the button in the toolbar, the text editing again uses the color of the text.